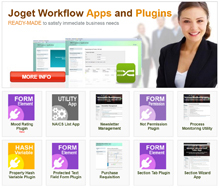 Joget Workflow Enterprise Edition Software Assurance includes support services that provide direct access to our engineers who are ready to assist you in the design, development, deployment, and management of workflow apps on Joget Workflow. Please feel free to contact us for further information. Joget supports major versions for two years after the first major release of the next version (for example, we support Joget Workflow v4 for 2 years after Joget Workflow v5 was released). This policy excludes maintenance builds and security patch release.